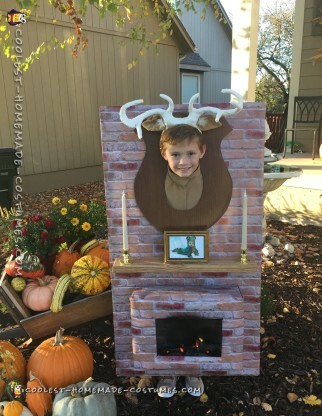 My son saw a version of this costume online and wanted to be a Moose head over a fireplace for Halloween. We used a photo booth backdrop paper from Hobby Lobby to cover the cardboard. We also used battery operated lights on the mantle and used a lightweight frame from Dollar Tree with a picture of my son from his first Halloween. I had battery operated Christmas lights wrapped around the wood in the fireplace (took out blue and green bulbs) and sprayed black paint as soot. The frame around his head was mounted with Velcro so that he didn’t have to trick or treat with the entire costume. It was covered with contact-type paper from Dollar Tree. Antlers were made by wrapping masking tape around aluminum foil and then wrapped with medical tape. Way cleaner than plaster and a good color match to the real antlers. The jacket is from Goodwill, and I cut the sleeve cuffs off. I Made ears and a tail to match. Huge reaction and loved by all!